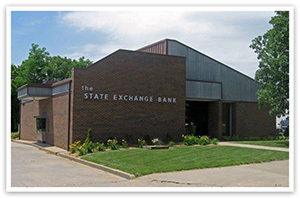 Chartered in 1887, The State Exchange Bank is a full service true community bank that is the only locally owned bank in Jewell County. We’re proud of that fact, and strive to provide the best possible service to our customers and our community. Our roots run deep in Jewell County, with rich history and experience that is second to none. We offer a wide range of financial services to fit your needs, from free personal checking and savings accounts, to a wide range of agricultural and commercial loans. Feel free to browse our new website and see for yourself what we can do for you. If you're an existing customer, please use this website to access all of your accounts for inquiries, transfer funds between accounts, or make your loan payment. Please contact us to get registered, or use the link to the left to get started right away. From all of us at The State Exchange Bank, we’re glad you’re here!